The McManus offers a programme of arts and heritage activities which aims to increase access, understanding and enjoyment of the museum collections and to encourage learning and cultural inclusion. The McManus offers a programme of arts and heritage activities which aims to increase access, understanding and enjoyment of the museum collections and to encourage learning for all. 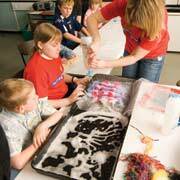 Our activities include facilitated tours and Creative Learning workshops. Self-led but can be planned with input from museum staff. Mon - Sat, 10 - 5pm and Sun 12.30 - 4.30pm. No need to book, but please let us know when you intend to visit. Educator’s packs for Group Leaders covering our permanent displays can be downloaded here. Please contact the Creative Learning Team for further information about our current charges and availability if you would like to book a facilitated tour or a creative workshop.